IN 1993, THE UNITED STATES, CANADA, and MEXICO signed the North American Free Trade Agreement (NAFTA), which created a regional free trade zone that lowered tariffs and trading restrictions and encouraged greater opportunities for cross-border investments and movement of goods and services between the three countries. The agreement went into effect in 1994. While all three states had well-established trading relations, a new arrangement was deemed necessary, in part, as a reaction to a similar economic initiative proposed by the European Community (EC). It was also part of the liberalizing trend in international trade, which has driven international economics since World War II. In 1944 and 1945, representatives from the Allied nations met at the NEW HAMPSHIRE resort of Bretton Woods to establish new international organizations that would regulate and systematize the international economic order. The first effort was the International Bank for Reconstruction and Development and the International Monetary Fund to aid in the development and stabilization of international currencies. Part of the proposed economic structure addressed the rampant economic nationalism that had pervaded trade in the 1930s and that was believed to have contributed to the deterioration in international relations that had led to the outbreak of the World War II. In 1947, representatives from 23 states met in Geneva, SWITZERLAND, to establish the General Agreement on Tariffs and Trade (GATT), which provided a framework to promote multilateral international trade and development, and thereby limit the threat to the international order of economic nationalism. GATT did not establish an organization that centralized trading agreement; rather it specifically encouraged multilateral free trade agreements, and was strongly supported by the United States. Since its signing, GATT has undergone several additions, the latest being the Uruguay Round in 1995 that established the World Trade Organization (WTO), which adjudicates free trade disputes. Since GATT was signed, several regional (multilateral) free trade zones have been established. One of the first was the European Economic Community (EEC), later known simply as the European Community (EC); it was created by West GERMANY, FRANCE, ITALY, BELGIUM, and LUXEMBOURG in 1957 to facilitate trade among its membership. The EC expanded to 15 nations as the EUROPEAN UNION and in 1993 became a single free trade market with a common currency, eliminating trade and fiscal restrictions and allowing for the internal movement of goods and services. 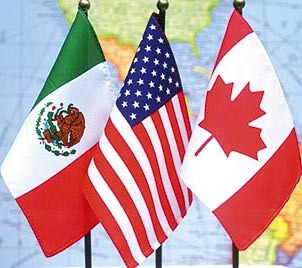 Growing concern among European trading partners, particularly Canada and the United States, and later Mexico, spurred an effort to form a similar agreement between the United States and Canada. The first step in the formation of NAFTA occurred in the late 1980s, when the United States and Canada signed a comprehensive trade agreement, the Canada-United States Free Trade Agreement (CUSFTA)to compensate Canada and the United States for any potential lost market share from the EC policy. The CUSFTA expanded on an earlier agreement that covered autos. Then in 1990, at the request of Mexico, a larger free trade agreement was proposed among the United States, Canada, and Mexico. NAFTA gradually phased out the bilateral CUSFTA terms, as well as preexisting quotas, tariffs, and investments, enlarging the market and labor available to American, Canadian, and Mexican trade. NAFTA required the three members to eliminate their respective trade barriers and restrictions to cross-border movement and transportation of goods and services, establish a framework for the extension of NAFTA to other regional members, such as a potential free trade agreement for the hemisphere, and provide for increased investment opportunities, thus combining trade and economic policies. The main benefits to the members are cheaper consumer goods, greater investment opportunities, and increased jobs as a result of trade. Removing tariffs forces industries to become more efficient and productive, thereby lowering costs. NAFTA is also intended to help international development by spurring industrial growth in Mexico and, it is hoped, a stronger middle class, while creating higherpaying, high-technology and white-collar jobs in the United States and Canada. There are, however, several problems with NAFTA. First, energy remains regulated and not subject to free trade. Labor unions criticized the agreement for outsourcing jobs to Mexico, where there are lower labor and environmental regulations and workers’ wages. A larger issue, however, is the misuse of the rules of origins, which allow members to declare certain goods not to be subjected to NAFTA because of the presence of nonmember components. Finally, NAFTA has hurt nonmember economies, especially in the Caribbean and South America.